Boral Ltd. plans to unload its Colorado ready mixed and aggregates operations in a $127 million deal with Denver-based Brannan Sand & Gravel Co. Boral Construction Materials spans a namesake Aggregates site plus and six plants under the legacy Ready Mixed Concrete Co. brand. Brannan operates three ready mixed, three aggregate and four asphalt plants serving the Denver-anchored Front Range market, plus an underground-construction business. The business emerged in 2004 from acquisitions in Colorado and Oklahoma as then-Boral USA sought a stake in ready mixed concrete and aggregates, alongside its Material Technologies and Bricks operations. 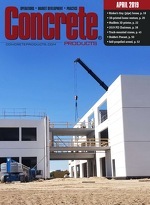 In the wake of the U.S. housing bubble and early post-recession years, Boral USA acquired the Owens Corning Cultured Stone business and pursued a Headwaters Inc. merger—positioning the ultimate Boral North America as a premier player in fly ash marketing, manufactured stone veneer, plus companion masonry and trim products. Boral produces Versetta Stone in Midnight, a dark gray hue with almond tones, and Sea Salt, a creamy beige and khaki blend. Boral North America’s Roswell, Ga.-based Building Products Division, a top player in manufactured stone veneer, is extending its Versetta Stone lineup with Carved Block, a profile reminiscent of split-face units. Shipped in 36-in. x 8-in. panels, Versetta mortarless stone veneer provides the aesthetics and texture of authentic stone masonry without the added skill and time required for installation. A larger stone format—with units from 16- to 20-in. wide and 8-in. high—Carved Block suits modern home styles and light-commercial applications. The Class A fire-rated panels install easily with nails or screws; do not require additional footings for support; and, feature an integrated moisture management system.